Thank you! Pierre de Coubertin (founder of the modern Olympics) stressed the importance of the journey over the result. No journey can be completed without the support of the many fans, followers, tweeps, and others. I look forward to sharing what I've learned through my new Gold Medal Strong program. Your support is greatly appreciated. Thank you for your interest. I look forward to working and connecting with you. After failing to secure a sponsor after the 2004 Olympics, Adam famously competed in a shirt that said "SPACE FOR RENT" and "MY MOM LOVES ME". So it’s okay to down regulate a testosterone levels now to address a genetic advantage. Seems inconsistent with clean sport. Georgia native, Adam attended The Lovett School in Atlanta prior to heading north for Dartmouth College, were he earned a degree in Government. 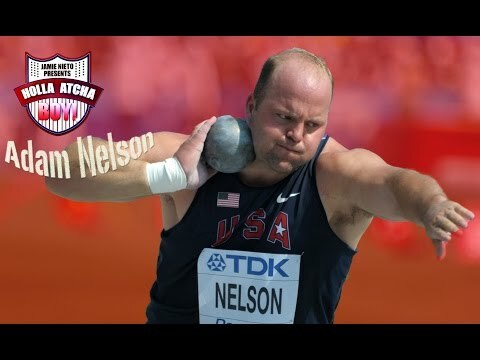 While with the Big Green, Nelson was a two-sport athlete, starting at linebacker on the football field, but he placed his stamp on school history by earning the 1997 NCAA Championship in the shot put. To this day, he still holds the Dartmouth College shot put record, besting the nearest competitor by nearly 2.5 meters. 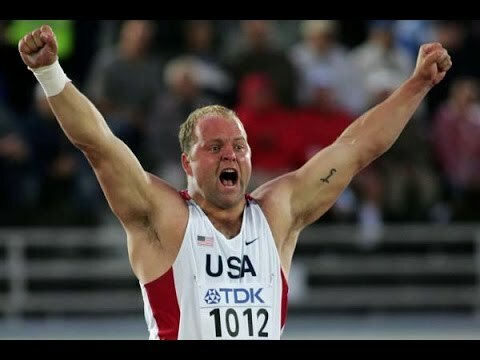 As he transitioned to the professional ranks, Adam continued his dominance on the world stage, earning Olympic Silver in Sydney (2000), and the eventual Gold in Athens (2004). An advocate from drug-free training, Adam states, "I started a website to promote it in 2002 with a friend of mine called throwclean.com. It seems kind of poetic that I was awarded the 2004 Olympic Gold Medal after another athlete tested positive for steroids." Adam maintains a focus on athlete rights as the former board President of the Track & Field Athletes Association, and has started a venture focusing on training, Gold Medal Strong. Though he is as active in the sport as ever, he finds value in time away from the track as well, "I'm one of a probably a handful of Olympians to attend a full-time MBA program (UVA's Darden School of Business) and still earn a spot and compete at an Olympic Games. Discipline isn't hardwork. It's just consistently working a routine." Given the nickname Peter Pan by his wife, Adam shares, "I'm not sure if it's because she thinks I'm aging well or refuse to grow up."